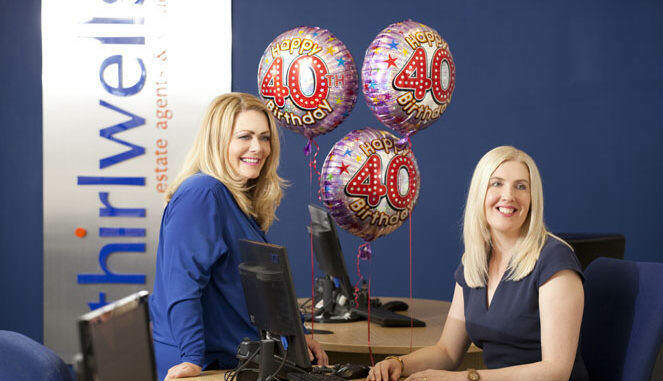 One of the region’s estate agents is feeling fabulous after reaching its milestone 40-year anniversary. Teesside’s Thirlwells, which employs 20 staff across its Middlesbrough and Billingham branches, opened in June 1977 and is now the longest serving, independent estate agents in the area. Over the last four decades, despite a tumultuous market of late, the company has continued to go from strength to strength and is looking forward to an exciting future, with expansion plans in the pipeline. “Our old but experienced way of doing things when the market crashed was invaluable,” said partner Wendy Clarke, pictured above (left) with partner Nicole Munro. “We’ve moved with the times but always listen to our customers and deliver the service they expect, and I truly believe that’s why we’re still here today and even growing. “Given the circumstances the whole industry has endured, we are so proud to still be here. With a reputation for extensive training programmes which produce knowledgeable and experienced employees who often dedicate their careers to Thirlwells, the Company enjoys low staff turnover, enabling it to form trusted relationships with clients. “Our motto is ‘The name you can trust’ and every single staff member adheres to this.